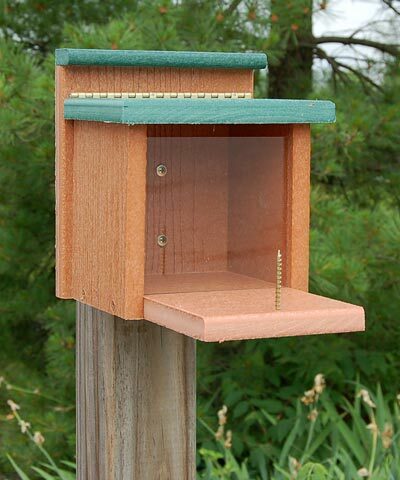 Create a feeding station just for squirrels using the Woodlink Going Green Squirrel Munch Box. Placing a squirrel-specific feeder in your backyard can sometimes keep these animals away from your bird feeders, and will certainly enable you to relish the squirrel antics. This clever unit works with squirrels' natural inquisitiveness, as they must lift the hinged roof to reach the feed inside the reservoir. The square chamber holds 1.4 quarts of peanut chunks, cracked corn, or seed blend, and a clear plastic panel on the front keeps it in place. An extended platform creates a resting spot for squirrels, and a screw here accommodates an ear of corn for an added treat. The brown body and green roof of the item bring a natural look to it, and the recycled plastic construction ensures a lasting and environmentally friendly piece. Two predrilled holes on the back of the unit enable it to mount to a post, fence, or tree in moments. Feed squirrels their own food in this Going Green Squirrel Munch Box. Made in the USA.